Ch4 18 – My Hero! It’s Monday! That means another page up for you wonderful folks! I’m sure the others have very good reasons as to why they are not flying The Order of the Nine’s trademark colours. It probably has something to do with the perils of their jobs and how the Champions don’t give them enough of a cut and all that jazz. I bet these poor Guardians need all the booze they can get their hands on after having to deal with the likes of Lark and his ilk! I feel like Hasera and Lark are going to be the only survivors soon. Pffft, we’ve got some named characters in the building across the way. Why would we name some characters to just kill them off moments after you’ve gotten to know them? Mind you, the building is an old Church to Jer’Zael and we did see some Abyssals upon its throne-like appearance. I’m sure they’re just the custodians… Whose job it is to… uh… keep the ivy wrapped around certain parts of the building and to… just… make it look run down! Yeah. That’s it! You gave us their names because you’re too smart to just slap red shirts on them. Also, as has been previously established they haven’t had any real dangerous work in quite some time and the world is actually becoming more peaceful. Chances are they’ve gotten comfortable and haven’t been keeping up on their training. If the Aby’s are serious about taking these “heroes” out they’re going to bring an over abundance of force. Trying to make a statement after all. That’s ludicrous! Me!? Smart!? Pshaw! A new set of undisclosed rules how fun. And of course the biggest problem with overly-long lists of rules is learning which ones actually exist for a good reason, which ones can be safely ignored, and how to tell the difference. Hopefully a little time out in the real world and away from HQ will encourage Hasera to start figuring that out. 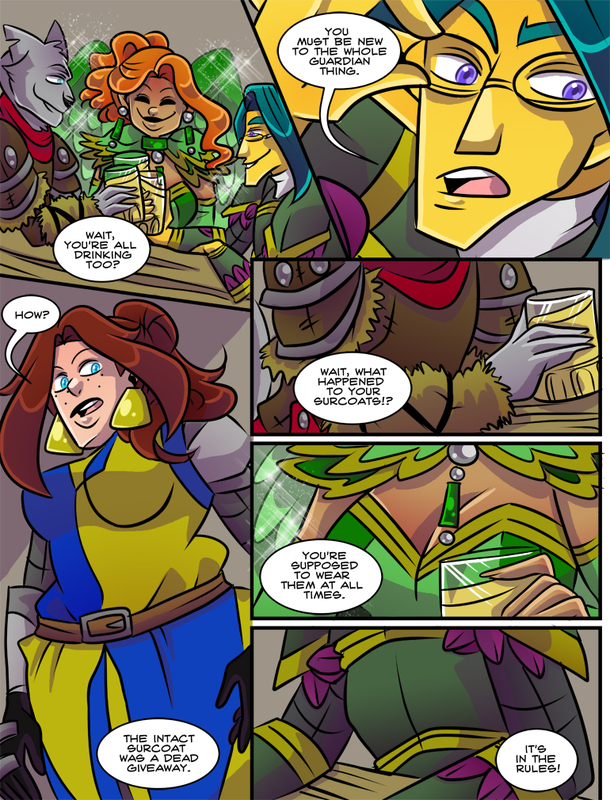 I like the point made in this comic about “the intact tabard”. If she had been a less-skilled fighter, she might still have survived that attack from the Abyssal Wyrm, but would her tabard fared as well? I suspect these other Guardians might actually disbelieve that Hasera has already been in a significant monster-fight –that’s how “new to the whole Guardian thing” they are thinking of her to be. Or, it could be they don’t want to mark themselves as targets. Why would any evil-doer ever target the hapless, life-saving Guardian, Bill?! That would be a terribly evil thing for a villain to do. Besides – the virtuous, powerful and always alert Champion would totally prevent such an outcome! Right? All I have to say to that is… YES. Your final, unspoken test as Guardians… is to survive long enough to realise that walking around with a target on your chest is a bad idea! No, really, the original surcoat design had an actual bullseye over the heart, but people were figuring that out far too quickly so we replaced it with this fashionable blue-and-yellow quartered design! Hilariously enough, the original design of Hass’ non-appealing garment had the symbol for The Order in the middle. The symbol being the 8 circles with the ninth in the middle. So… you’re not far off on that one. Isn’t it pretty likely that she is new anyway? Nobody lasts long with this guy and guardianship is permanent so it is unlikely she had a previous partner unless the person died? What Hasera is wearing is actually called a surcoat. Tabards are only waist length with open sides and often have sleeve-panels (think “Three Musketeers”). I know, I’m a huge dork for saying it, and its not that important but there you go. Anyway, this is still a fun comic, so keep up the good work. Thank you for that! I could not remember the word for the garb Hasera and other Guardians are wearing. It is a surcoat in the current format! Ok I would actually be surprised if something like this would happen. And even if, Hasera would probably just ruin it for everybody. Look, if you want to waste that potentially tremendous cleavage behind a surcoat that’s your lookout. My green dress is fabulous.